Scars are areas of skin that have been wounded and replaced by fibrous tissue that does not resemble the surrounding skin. It may appear darker or lighter or have a variety of shapes, often resembling the initial wound. Scarring is a natural part of the healing process after injury to the dermis (the deep, thick layer of skin). Most wounds after accident, disease, or surgery results in some degree of scarring. Injury to the upper layer of skin, the epidermis, does not result in scarring. This is why uncomplicated cases of chickenpox or poison oak rashes that do not become infected do not usually result in scars. Various factors influence how a person’s skin scars. the depth and size of the wound. Deeper wounds are more likely to scar. the direction of the wound relative to the body. Wounds that move parallel to fibrous tissue in the skin are less likely to cause larges scas than wounds that cut across those fibers. Scar tissue is the same protein (collagen) as the tissue that it replaces, but the fiber composition of the protein is different. The fibrous tissue in normal skin has a distinct pattern, like the warp and weave of a fabric, but a scar has a random, chaotic pattern of collagen fibers. The skin that has been scarred is different from normal skin as well. Scars are less resistant to ultraviolet radiation, and sweat glands and hair follicles do not grow back within scar tissue. 1) Hypertrophic Scar. Hypertrophic scars occur when the body overproduces collagen, which causes the scar to be raised above the surrounding skin. Hypertrophic scars take the form of a red raised lump on the skin. This type of scar can occur after any type of injury, including surgery and acne. Keloid Scar. Keloid scars are a more serious form of scarring, because they can carry on growing indefinitely into a large growth. Keloid scars can occur on anyone, but they are most common in dark-skinned people. Keloid scars can be caused by surgery, an accident, by acne or, sometimes, from body piercings. In some people, keloid scars form spontaneously. Keloids can be itchy or painful in some individuals. They tend to be most common on the shoulders and chest. 3) Contracture scars. If your skin has been burned, you may have a contracture scar, which causes tightening of skin that can impair your ability to move; additionally, this type of scar may go deeper to affect muscles and nerves. 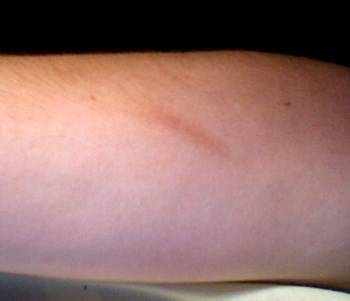 4) Atrophic Scar. An atrophic scar takes the form of a sunken recess in the skin, which has a pitted appearance. These are caused when underlying structures supporting the skin, such as fat or muscle, are lost. This type of scarring is often associated with acne, chickenpox, staph or strep skin infections, surgery or accidents. 5) Stretch marks. Stretch marks (technically called striae) are also a form of scarring. These are caused when the skin is stretched rapidly (for instance during pregnancy, significant weight gain or adolescent growth spurts), or when skin is put under tension during the healing process, (usually near joints). This type of scar usually improves in appearance after a few years. Elevated corticosteroid levels, as occurs during pregnancy, are implicated in the development of stretch marks. There are a variety of treatments available to minimize the appearance of scars. Large disfiguring scars are, however, difficult to successfully treat and may require multiple sessions of different treatment approaches. It is important to point out that many home remedies or over-the-counter treatments are ineffective at reducing the size or appearance of scars. Topical corticosteroids, such as hydrocortisone, are ineffective. Vitamin E and onion extract (Mederma) is ineffective. Vitamin E causes contact dermatitis in up to 33% of users and in some cases it may worsen scar appearance. Vitamin C and some of its esters may fade the dark pigment associated with some scars minimizing its appearance. It does not, however, reduce the size of the scar. Chemical peels remove the uppermost layer of skin (epidermis) leading to exfoliation and the alleviation of certain skin conditions including superficial acne scars. The depth of the peel can be controlled. Chemical peels are used with caution in dark-skinned individuals and those susceptible to developing keloid scars. Dermal fillers, such as Juvederm® or Restylane®, can be used to temporarily raise atrophic scars to the level of surrounding skin, reducing their appearance. Dermabrasion may be useful for some forms of acne scars and other scars with mild pitting. Non-ablative lasers may be used to treat hypertrophic scars and keloids. This laser therapy smoothens the skin by heating up and redistributing collagen while avoiding damage to the epidermis via contact cooling. Multiple sessions are usually required for a significant reduction in redness and improvement in the texture and pliability of hypertrophic scars and keloids. Ablative lasers, such as the carbon dioxide laser or Er:YAG laers, are usually preferred for atrophic and acne scars. Like dermabrasion, ablative lasers work by destroying the epidermis to a certain depth. Healing times following ablative laser treatments are much longer and carries greater risks compared to non-ablative laser therapy, but non-ablative lasers offer only minor improvements in cosmetic appearance of atrophic and acne scars. Silicone scar treatments are commonly used in preventing scar formation and improving existing scar appearance. Semiocclusive silicone based ointments are used to speed healing and reduce the appearance of scars and likely work in a similar manner as silicone scar sheets. Pressure dressings are commonly used in managing burn and hypertrophic scars, although supporting evidence is lacking. It is believed that they work by applying constant pressure to surface blood vessels and eventually causing scars to flatten and become softer. A long-term course of corticosteroid injections into the scar may help flatten and soften the appearance of keloid or hypertrophic scars. The corticosteroid does cause thinning of the skin tissue so it does carry risks. Scar revision may be possible in some cases. This involves carefully cutting the scar tissue out (excision) and carefully closing the wound in a manner less likely to scar. Excision of keloid scars unfortunately has a high recurrence rate close to 45%. 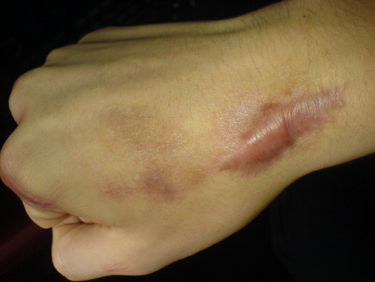 In some cases, particularly for burn victims, a skin graft may be recommended. During a skin graft, the dermatologist or surgeon removes skin from another area of the body. If you’ve recently undergone plastic, cosmetic or other surgery that has caused your scars, it is best that you wait at least one year before making a decision about scar treatment. Many scars fade and become less noticeable over time.